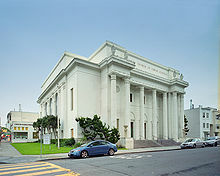 Internet Archive headquarters in San Fransico, California. The building is a former Christian Science Church. The Internet Archive (IA) is a non-profit organization based in San Francisco, California that has an on-line library and archive of Web and multimedia resources. The Internet Archive was founded by Brewster Kahle in 1996. This archive includes "snapshots of the World Wide Web" (archived copies of pages, taken at various points in time), software, movies, books, and audio recordings. To make the books available on the Internet, they are first placed into special scanning machines by volunteers and employees of the library. These machines take very high quality pictures of the books' pages, and then images and text of the books are freely available on the Website. This process is called "digitization". The old collections of films and sound are digitized in this way too before being made available online. All of the original books, movies, records and so on are stored in a giant warehouse in California, just like normal libraries store their smaller collections of books or other records. This collection is called the Open Library and aims to create "one web page for every book ever published." It was created by computer programmer and activist, Aaron Swartz. The Archive also purchases new electronic books and loans them out to readers just like any other normal library. 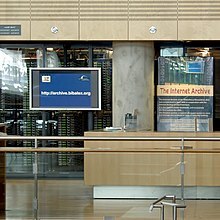 These electronic books can be read by viewing the Website, on the reader's own computer or electronic reading device, and even in special reading areas inside the Archive where the tables have touchscreens and computers built into them. To ensure the stability and endurance of the archive, The Internet Archive is mirrored at Bibliotheca Alexandrina in Egypt, the only library in the world with a mirror. The Internet Archive makes the collections available at no cost to researchers, historians, and scholars. The Internet Archive is a member of the American Library Association and is officially recognized by the State of California as a library. This page was last changed on 23 January 2018, at 21:14.